Ok, I’m on a salad jag. What can I say? All the vegetables and fruits in the market are so beautiful, they call out to me. So why not put them together? Technically avocado is a fruit, but most of us think of it as a vegetable, so that’s how I’ll refer to it. Rich in healthful mono-saturated fat, avocados are nutrient dense, providing vitamins K, C, E folate and most of the B vitamins as well as fiber, lutein and magnesium. While we usually associate vitamin K with blood clotting, it is essential to building strong bones. Calcium cannot do it alone. This pretty salad can serve as a first course. Or you can transform it easily into a light main-course with a sprinkling of sunflower seeds and a few tablespoons of crumbled ricotta salata, dry white goat cheese, or feta cheese. For the meat eaters out there, which includes me upon occasion, a paper-thin slice or two of prosciutto wouldn’t hurt, either. Serves 2; recipe doubles easily. 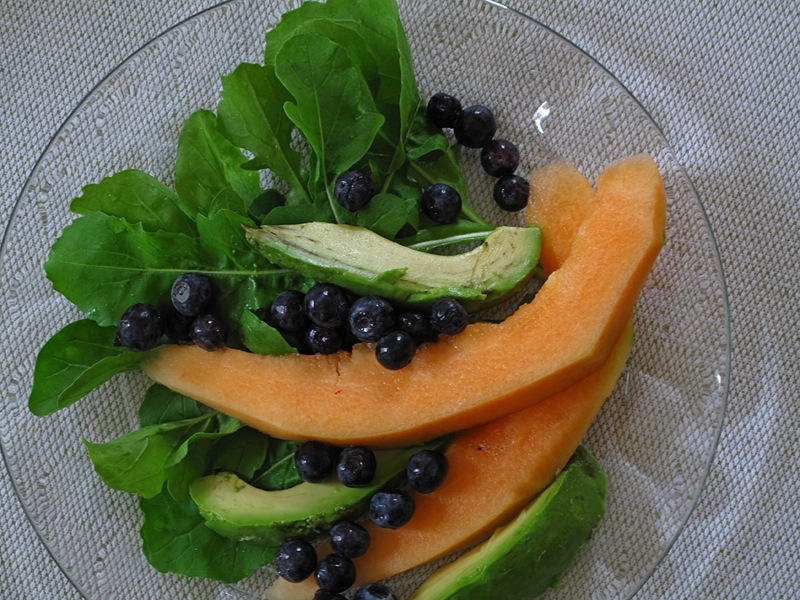 Arrange 1 cup of arugula on each of 2 salad plates. Decorative arrange the melon and avocado slices on top. Scatter the blueberries over the salads. Drizzle the lemon juice or vinegar and olive oil over the salads. Serve at room temperature or slightly chilled. Who ever said good nutrition has to be dull? 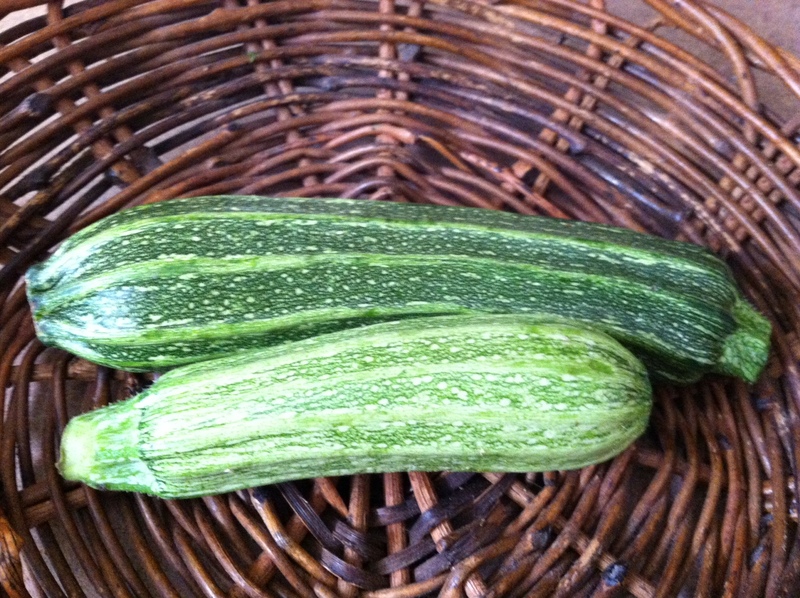 Raw zucchini is highly alkalizing, rich in fiber and low in calories, containing only about 20 per cup. It provides a little incomplete protein (2 grams), which the cheese in this recipe will boost, roughly one-third of the RDA for vitamin C, a bit of vitamins A and K, two important carotenoids—lutein and zeaxanthin—some B2 (riboflavin) and B6 (pyridoxine), potassium and manganese. This refreshing, sophisticated recipe, which I picked up on a hot afternoon at Ristorante Leo in Florence, is best made with Romanesco zucchini, the ribbed variety that produces all the flowers. It is not as prolific as more commercial types; so look for it at farmer’s markets and specialty produce stores, or grow your own. It has marvelous flavor and a firm,crisp texture, which holds up well even with cooking. Also, choose the youngest, sweetest onions you can find and shave them paper thin. Serves 4 as a first course. Using a mandolin, a swivel-bladed vegetable peeler, or the slicing blade of a box grater, shave the zucchini lengthwise into very thin, wide ribbons. Thinly slice the onion. Toss the zucchini and onion with the lemon juice and olive oil. Season lightly with salt and generously with freshly ground black pepper. Arrange the salad on 4 plates. 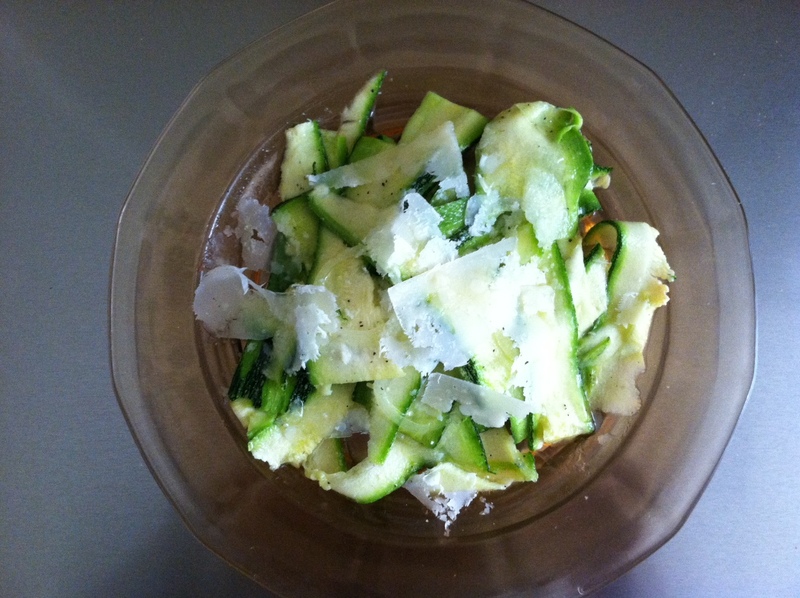 Scatter the cheese over the zucchini and drizzle the truffle oil on top. Serve at room temperature or lightly chilled.